The Sewer Line of your Home or Business performs a Vital Task, all wastewater from every Sink, Shower, Toilet, and anything else using water, is sent out of the building through one pipe, this is your Sewer or main building drain. 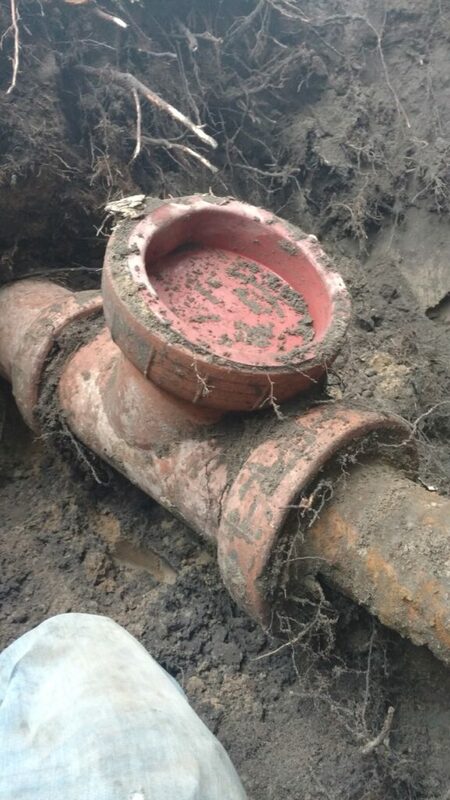 When this pipe becomes Clogged or Broken it essentially shuts down your entire Plumbing System. Continuing to use the Drains in your building after the Sewer is Clogged will cause all liquid and solid waste put into the system to find relief. In this case, finding relief means liquid and solid waste will back up in the lowest drain. Often times, the lowest drain is in your basement; your basement floor will flood with wastewater. Those without basements will often see this waste come up in their bathtub. Either way, this is something you want to avoid at all costs. The best way to avoid such problems is to have your Sewer Line regularly Cleaned and Inspected with a Sewer Camera. The cleaning keeps Roots and other causes of Blockage at bay while the camera allows Rooter Right to identify potential problems in your sewer that may need addressing. 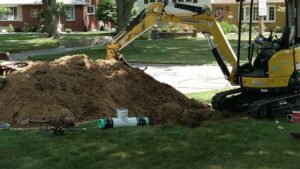 Sewer Line Repairs and Sewer Cleaning are Services we specialize in at Rooter Right Plumbing & Drain. Let our experts guide you through your sewer problem, whether it’s a simple Backed Up Line, or Total Replacement of your Sewer Line. Rooter Right has all the Knowledge and Equipment to tackle any Sewer Issue in all Residential and Commercial settings. 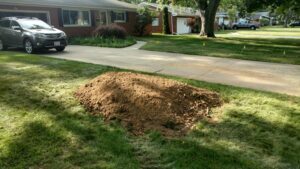 The most common cause of Sewer Line Blockage is Tree Roots. 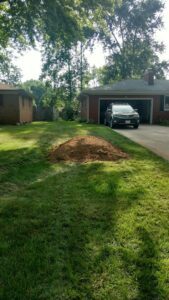 Tree Roots can be detrimental to the health of your sewer system. If tree roots have penetrated your line you must maintain your pipe regularly before they take over. It only takes a small crack in a pipe joint for a tree root to find its way in, once they’re in, they take root. A tree root, as thin as a strand of a hair makes its way through the pipe and once on the other side it blossoms and multiplies. The longer roots are allowed to grow unimpeded, the stronger they get. Eventually, the thin strand expands to the point that it acts as a net, catching everything that passes through the sewer line; this stops the flow of water and solids through the line leading to blockages. 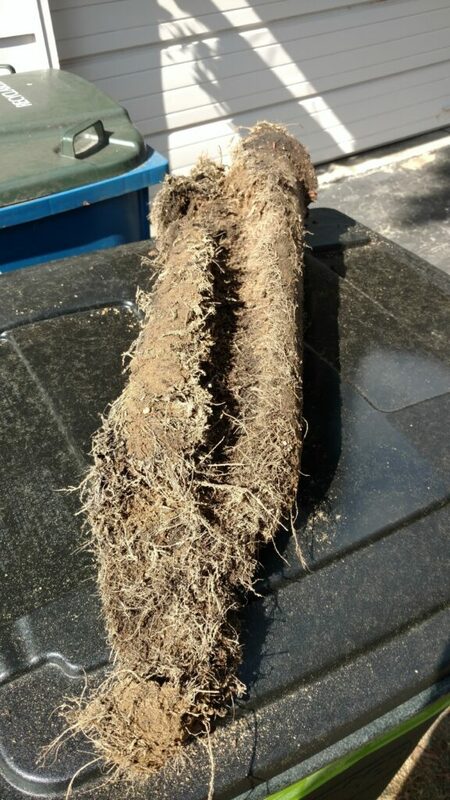 In some cases, the roots go unchecked for so long that they can fill the entire pipe leaving just a small channel for waste and water to pass through. The best way to maintain the Roots in your Sewer is to perform regular maintenance cleanings with root cutting augers. We have augers for every scenario from the size of a teaspoon on up to six inches in diameter (which is the size of the average sewer line). Other causes of line stoppages include: sludge build up, lack of downward angle or “fall” from the building to the municipal main, broken sections, and areas of the pipe that dip down and come back up, otherwise known as bellies. Cleanouts are the best access point for battling Sewer issues. A Cleanout on the outside of the building provides the ideal environment for servicing your Sewer Line. A six-inch cleanout allows the technician to cable or auger your line using the biggest cutting tool possible, which ensures that when your line is being serviced all the Roots are cut out and removed. Water Jetting the line from a cleanout gives the best direct access to the pipe with minimal turns that allows the jet hose to move smoothly and efficiently through the line. 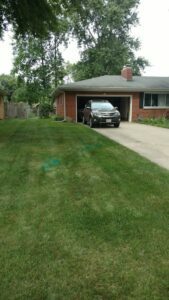 Another great feature of the outside cleanout is the fact that the mess often created when servicing your sewer line is kept on the outside of the home or building instead of in a basement, closet, crawl space, or other living area. Camera Inspections are the best way to assess and locate problem areas within your Sewer. Our systems send a High Definition Camera directly into the Sewer Line that allows not only our technicians, but also our customers, a glimpse of exactly what is causing the problem. Another great feature of the camera is a built in Sonde, or Location Device. The Sonde sends a signal up through the ground that can be picked up by a locator. This allows us to pin point exactly where on the property the trouble spot is located allowing for Fast and Accurate Estimates on Sewer Repairs. Also, a helpful tip when purchasing any kind of real estate is to make sure to have the Sewer Line Inspected by the Professionals at Rooter Right. 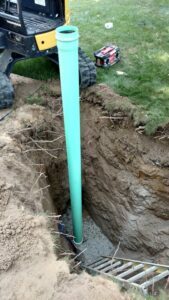 A Camera Inspection allows you to fully understand the state of the Sewer Line so you know what you’re getting into before you make the purchase. This simple step can save a lot of time, money, and stress and allow you to make the most educated decisions within your negotiations. In some cases, complications with your Sewer cannot be solved with cleaning techniques. 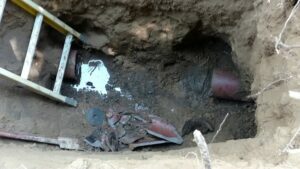 Sometimes older lines can become Separated, Collapsed, Broken, or so infested with Tree Roots that affected sections of pipe must be physically removed and replaced with new. If your problem is localized often times your existing Sewer can be patched. If the problem is systemic, the solution may be to replace the entire line. All Repairs and Replacements performed by Rooter Right are done with PVC pipe and include the Installation of a Cleanout. In cases where excavation is not practical, we offer trenchless repair options. The affected area is patched by sending equipment into the pipe, directly to the problem. 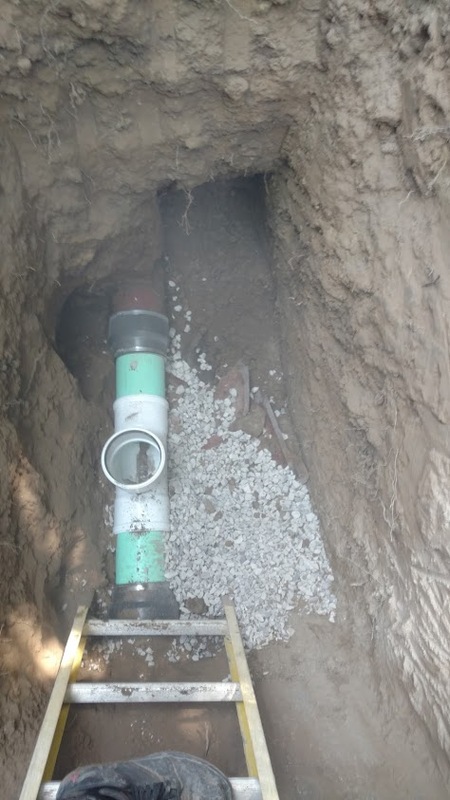 From there, the pipe can be lined with an epoxy resin that inflates and coats the interior of the pipe, leaving a new smooth surface for the smooth flow of wastewater.